We are big fans of EPIC the movie - and now families can experience an adventure of "EPIC" proportions first hand, while staying at the Sheraton Hacienda del Mar Golf & Spa, Los Cabos! In celebration of the release of 20th Century Fox’s animated film, EPIC, Sheraton Hacienda del Mar Golf & Spa, Los Cabos is combining the best of this action-packed family feature with its award-winning ammenities to bring guests an experience that is right out of this storybook adventure. The newly designed kids room incorporates eye-popping imagery throughout its walls that will make the colorful cast of characters from this film come to life—literally! Sheraton Hacienda del Mar Golf &Spa, Los Cabos is also offering special packages for kids and adults alike that is sure to be a hit for the entire family , from now until December 15, 2013. Families can book online to stay in the Deluxe Room equipped with a Jacuzzi, walk-in shower, Sheraton Sweet Sleeper bed and a private terrace, with prices starting at $140 USD per night. 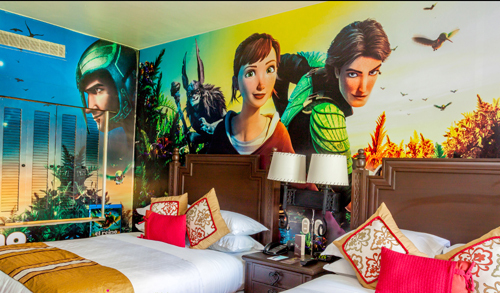 The themed room features eye-popping imagery throughout including walls that will transport guests to the magical world of M.K, Nod, Ronin and the rest of the colorful cast of characters from the fantasy/ adventure film. As a AAA Four Diamond resort, the Sheraton Hacienda del Mar Golf & Spa Resort is able to cater and celebrate each family member uniquely. With these special packages, kids 12 and under can eat free from the kids menu with the purchase of an adult meal as well as sip on complimentary milkshakes at Tomatoes Restaurant and take home a surprise souvenir at the end of their stay. For the adults, the resort provides plenty of recreational and relaxing diversions, including championship golf, a spectacular spa and fitness center, sparkling pools, along with two fabulous Five Star Diamond Award-wining restaurants including De Cortez Mezquite Grill and Pitahayas and, of course, the white sand beaches and sparkling sea of Cortez. For more information on the Sheraton Hacienda del Mar Golf & Spa Resort’s packages, or to make reservations, you can call 52-624-145-8000 or visit www.sheratonloscabos.com.